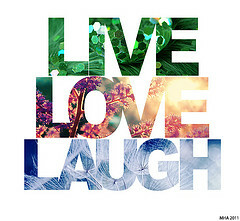 credit: Malin Helene (Flickr)Ladies, how many of you have the phrase “Live, Laugh, Love” somewhere in your online dating profile? You can raise your hand, it’s OK! We’re all guilty of using clichés, but some profiles take it to the next level. And if yours is littered with them, many guys won’t know what to message you about. These overused phrases don’t give anyone the ability to start a conversation with you. As traditional “hunters,” men are primed to initiate conversation with a woman — both online and off. But how are we supposed to initiate an exchange if we only have clichés to go on? Here are some examples of how clichés on women’s profiles can often yield uninspiring opening statements from men, which consequently fail to grab their attention. This description gives guys the ability to start a conversation about his favorite area beach or his go-to place to eat down the cape. Details matter! There are many elements someone can message about, from what’s on his DVR to favorite shows, or comparing your ideal social scenes around town. Easy! Guys can get a better feel of what kind of person you are by reading what you do with those you’re closest to. Most people want someone who can not only mesh with you, but are able to hang with your family and friends, too — who will inevitable join your duo. The Spice Girls sang it best: If you wanna be my lover, you gotta get with my friends… They were onto something! Forming strong relationships is all about building rapport by sharing intriguing details and fun tidbits about your life. Cliché’s are a turnoff … and a dead end to starting a conversation. If you’re specific about your interests, guys can be more explicit in initial messages, which will ultimately keep them from throwing dreaded clichés (or creepy responses) back in your inbox. What clichés (guys and gals!) are you guilty of using? We’d love to hear them below! Distance Makes the Heart Grow Fonder. Or Does It?